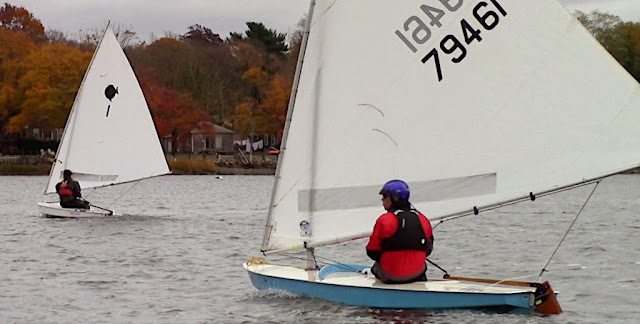 Bernadette Levesque (sail #1) joins the MYC@Barrington fleet, bringing the total to 3 MYC frostbiting sailors so far. We want to welcome another MYC skipper to the MYC@Barrington ranks. Bernadette Levesque has joined Gary Werden and Mark Stoughton for the fall festivities. Coming fresh off her "Most Active Skipper" and "Most Improved Skipper" awards at the MYC banquet last night, Bernadette started with a bang, adding a BYC first place trophy glass to her collection by taking 5 out of 6 races to lead the B fleet for the day, and 7th place overall, just behind Gary Werden. Mark Stoughton volunteered to help out on the shorthanded Race Committee for the day, so was given average scores for the day. Bill Brangiforte had the BoatCam on his boat for the day, but technical difficulties caused the camera to record only the single shot that we've posted here. Hopefully we'll have better luck next week. 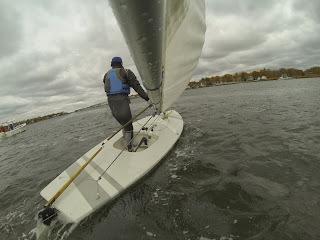 The day was chilly and breezy, with 12-15 mph winds coming out of the north, almost straight down the river. The tide was flowing out for most of the day, shifting only during the last race. Bill Brangiforte took first for the day, Beating out Doris Aschman, Ken Charles and Andy David. Gary Werden got his first 1st in Race 4, taking the pin end all by himself at the start and going left when the rest of the fleet went right. He gained a big lead at the windward mark and never looked back. Doris Aschman and Ken Charles also took first 1sts today.